You don’t want to miss this one. Nights like it don’t come around very often. Two of our area’s biggest food and drink talents are coming together for a homestyle feast. Peter Chang has been called the best Szechuan chef in America. He has won rave after rave, and his food has inspired critics and foodies to drive hundreds of miles just to taste it. The cooking style of the former chef to the Chinese Embassy is known to be no-holds-barred, unadulterated to suit American tastes. Yet, on September 3, he is doing something that even he doesn’t do very often – serving the homestyle food he remembers eating when growing up, like his grandmother used to make. As Chang’s business partner Gen Lee explains, the authentic Szechuan food on the regular menu of Peter Chang’s restaurant, which is not at all like the Americanized food at your typical takeout joint, might appeal to just 10% of Chinese food fans in the U.S. For this homestyle feast, though, Lee says that Chang’s food might appeal to just 1% of Chinese food fans. This is the real deal. After an array of appetizers like 鬼椒薫鱼柳 (Smoked Fish w. Ghost Chili) and 葱煎牛肉饼 (Pan-fried Beef Cake), Chang will dish out a five-course menu of dishes like 𧐢汁焗藕饼 (Lotus Root w. Oyster Sauce) and 川式干蒸红鱼 (Red Snapper in Szechuan Style). 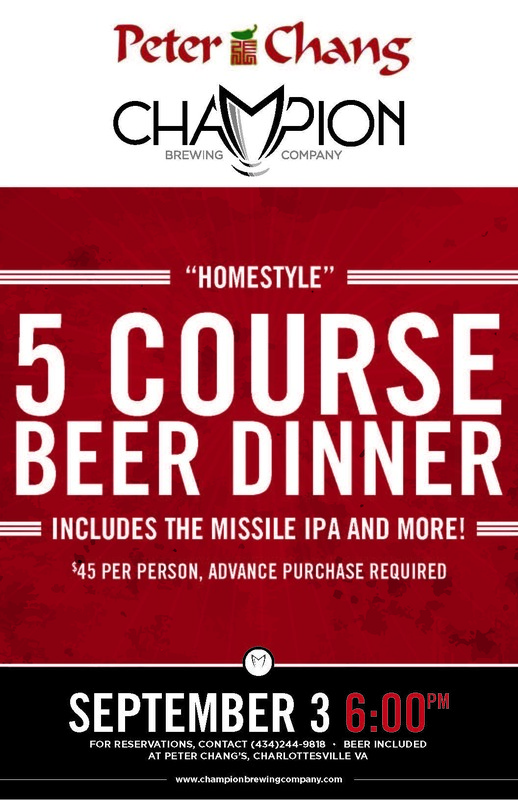 Better yet, each course will be paired with a beer from Champion Brewing Company, which has been called one of the fastest growing breweries in the country. Champion’s founder and head brewer, Hunter Smith, will be on hand to make the pairings. Chang’s food and Champion beer. All for $45? We’ll be there.